What Does 6 Months of Developer-Effort Look Like? 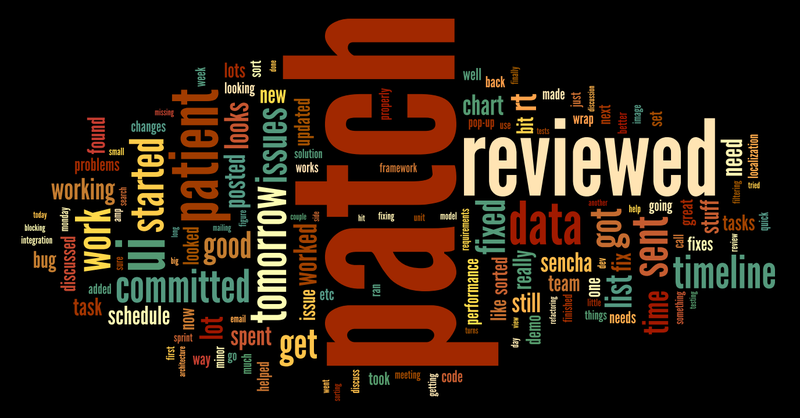 Image generated using Wordle. Click to enlarge. This is a cloud of the most commonly used words in my timesheet entries for a project I worked on over a six-month period. (When you work at a services company, you have to log all your time using archaic worklog software that only works properly in IE7 and below.) Size represents frequency, so the bigger the word, the more I used it to describe what I do. 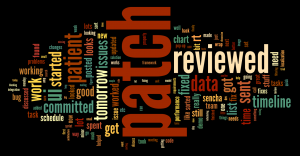 I’m happy to point out that patch is my most-commonly used word, followed by reviewed. We’re religious about code review at Macadamian, and it’s awesome to me that this is spelled out so clearly in my notes. Something I’m not as proud of is that tests is a tiny little speck (above the V in reviewed). It’s beaten out by crutch words like etc and sure. Worst of all, we had unit tests set up on this particular project (front-end and service-level). Why did it have such little impact in my notes? This is something that I think I should be spending more time on. It’s rare to get such a clear glimpse of what my priorities are. I spent nearly 1000 hours of my life on this project, and in one simple image I can see where all that time went. It’s both humbling and encouraging to get this sort of perspective. What do you think your cloud would look like? Also, out of curiosity, what is the ratio (% lines of text) of your test cases in each patch post? I remember when I was doing more coding, my test cases could easily occupy half the post. Taking a quick look, the tests section on my patch notes was generally not so large. I seem to remember writing longer test sections on projects in my earlier Macadamian days. I wonder if it’s a cultural thing? I’m going to try taking testing more seriously for the next little while. We’ll see how it goes! That image is cool. Would you mind if I were to link to this image from me facebook?